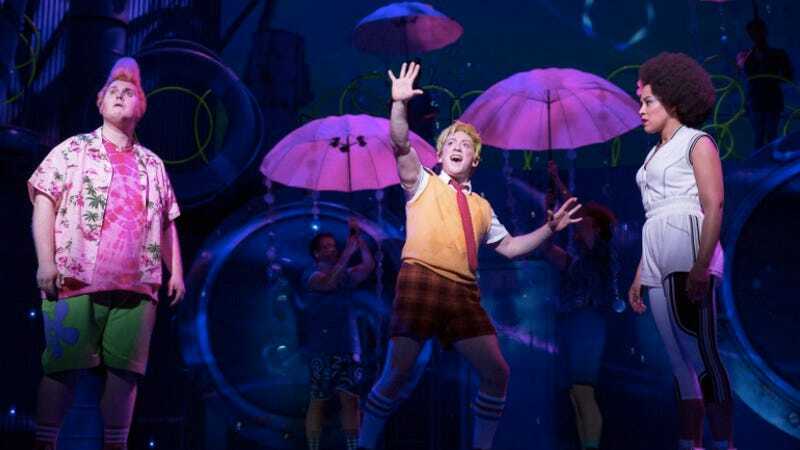 The waterlogged world of SpongeBob Squarepants will be on Broadway later this year as the musical based on the Nickelodeon cartoon is set to begin performances in November. The show—which played Chicago last summer—boasts tunes composed by a host of artists including The Flaming Lips, T.I., John Legend, Sara Bareilles, Lady Antebellum, and the late David Bowie. The driving creative force behind the project however is Steppenwolf member Tina Landau, who directs. According to a press release, the production has a log line that’s significantly more dramatic than what you’d expect: “Stakes are higher than ever before as SpongeBob and all of Bikini Bottom face the total annihilation of their undersea world. Chaos erupts. Lives hang in the balance. And just when all hope seems lost, a most unexpected hero rises up and takes center stage.” Ethan Slater will star as the titular sponge, and previews begin November 6 before a December 4 opening. Meanwhile, if SpongeBob Squarepants doesn’t have enough beach vibes for you, Broadway’s next season will also feature a jukebox musical of Jimmy Buffet songs called Escape To Margaritaville.